I scanned this from Don Glut’s Dinosaurs: The Encyclopedia, page 215. There must be better quality versions somewhere, because this is one of the Field Museum’s own photos — negative #GN 86962 — but I can’t find it in their singularly unhelpful online photo archive. 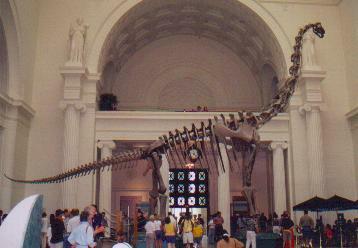 The Brachiosaurus mount in its original position in the main hall of the Field Museum. I can’t find a higher resolution version of this photo — can anyone help? at the miserably low resolution shown here (358×248). 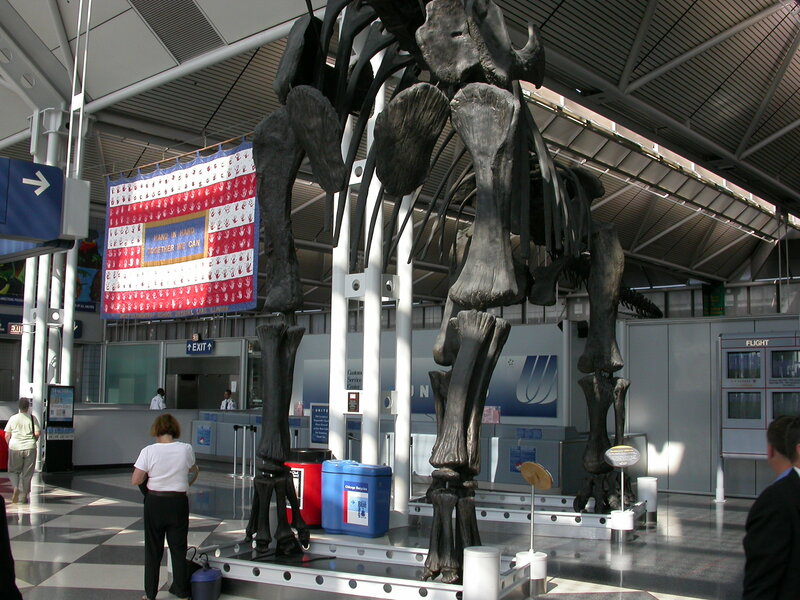 More generally, almost every photo of a mounted Brachiosaurus out there seems to be from either the picnic area outside the museum, or O’Hare Airport. If anyone’s able to find decent-resolution examples of this skeleton indoors, please do drop the links into a comment. I think that the mount got moved outside just a bare handful of years before digital cameras went from rare to ubiquitous. If the move had happened even five years later, I’ll bet there would be loads of photos of the old mount. I’m sure he’s right. But someone must have half-decent photos from back then? Seriously — is this tiny photo the best photographic record we have? 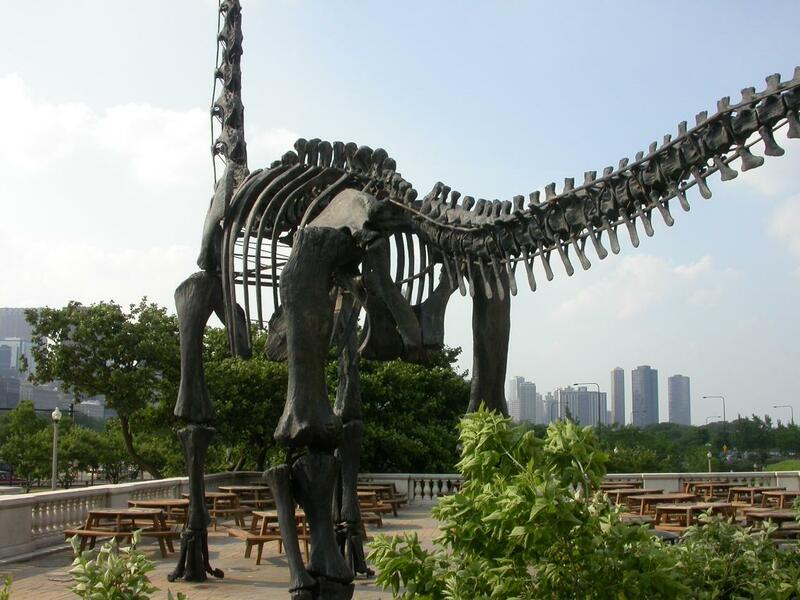 Of course, the real question is: why did they shove the Brachiosaurus outside? It was mounted in 1994, and taken down again in 1999, so this marvellous mount — by any objective standard the single most awesome exhibit in the museum’s history — was only actually in residence for five paltry years. 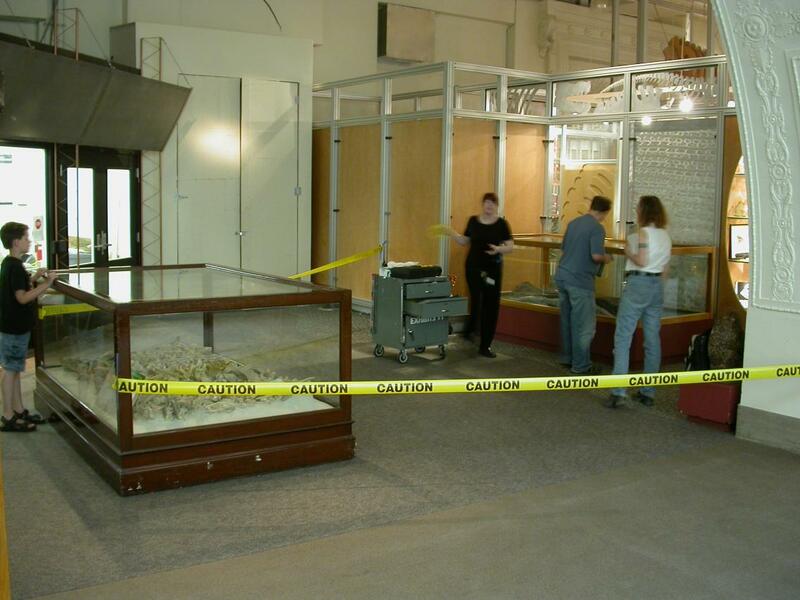 The standard explanation is that it was removed “to make space for” Sue, the vulgar overstudied theropod. But a glance at the photo above shows that there was plenty of space to put in half a dozen T. rexes without needing to move the brachiosaur. I can only assume that someone realised having a brachiosaur next door would make Sue look feeble. It’s a tragedy. Thanks to Dean for finding this one: small, but beautiful. Glut, Donald F. 1997. Dinosaurs: The Encyclopedia. McFarland & Company, Inc., Jefferson, North Carolina. 1076 pages. 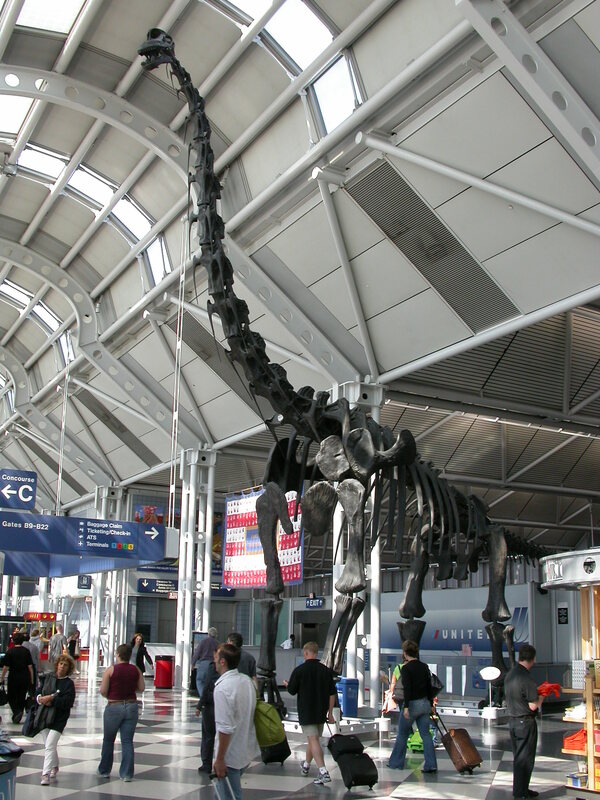 After P.A.S.T president Gilles Danis commented on our post about the Chicago airport Brachiosaurus mount, I got into an interesting email conversation with him. Here, posted with his kind permission and only lightly edited, are his thoughts on the Brachiosaurus mount. 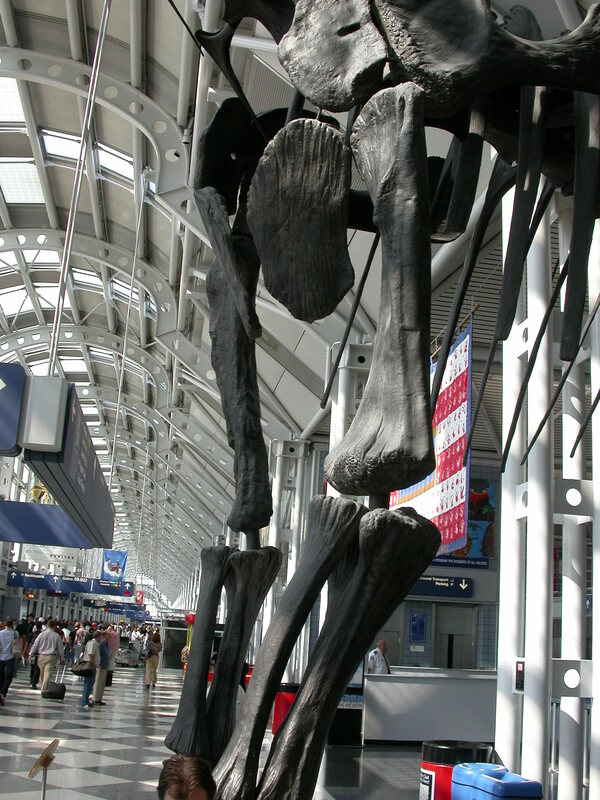 Brachiosaurus mount at Chicago O’Hare Airport, terminal one. Pelvis in ventral view, anterior to the left. On the mount that was in the museum and later was moved to the airport, we had a peculiar situation to deal with. Because museums like to have people walking under the rib cage of high sauropods, this becomes a safety hazard for two reasons. The first is that it cannot be allowed to fall on the people (obviously) and even though the cast was of light plastic, the engineers insisted in overbuilding the support (namely the legs and arms). Also because while in the Field Museum, it stood in the path of a fire exit, we had to have a certain amount of distance between the front and hind limbs (I forget the exact measurement). 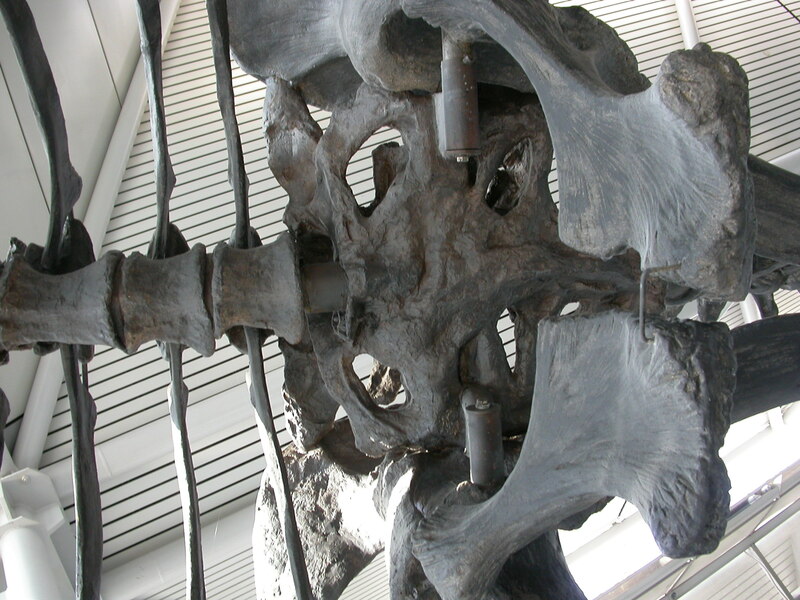 The only way that we could achieve that was to add two vertebrae for a total of 12 dorsals. We chose to duplicate two of real vertebrae at the lower end of the dorsal section. The funny thing is only one person figured that one out and that was Bill Simpson the collections manager. Also to support this structure, we were asked to used way oversized steel in the limbs which meant that we had to “inflate” the real humerus and femur to accommodate the material. This is why the cast is so bad; it is half stuffing. It is interested to see how a lie perpetuates itself. 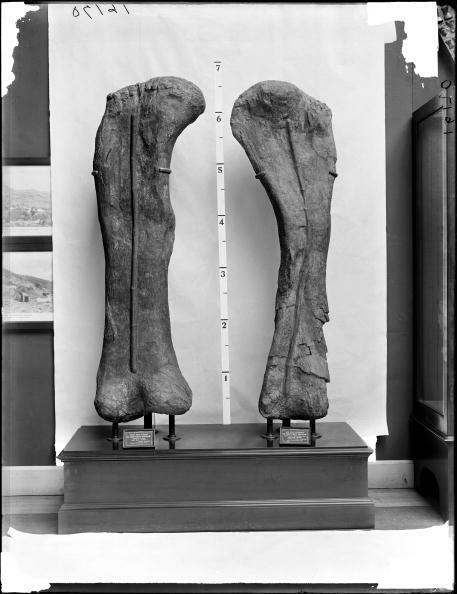 The following year, the Hayashibara museum ordered a mount of the same skeleton and they were very interested in getting the distance between the feet and manus. So we, again, had to make a Brachiosaurus limoensis. Not satisfied with this silly situation, Disney came to us in 1996 and ordered that very same skeleton again with the stretch limo factor for another dinosaur that you walk under for the Wild Animal Kingdom park in Orlando. Up to that point, only Bill Simpson had realized the error. But I had just had it up to there with these stretch dinosaurs and revealed the problem. 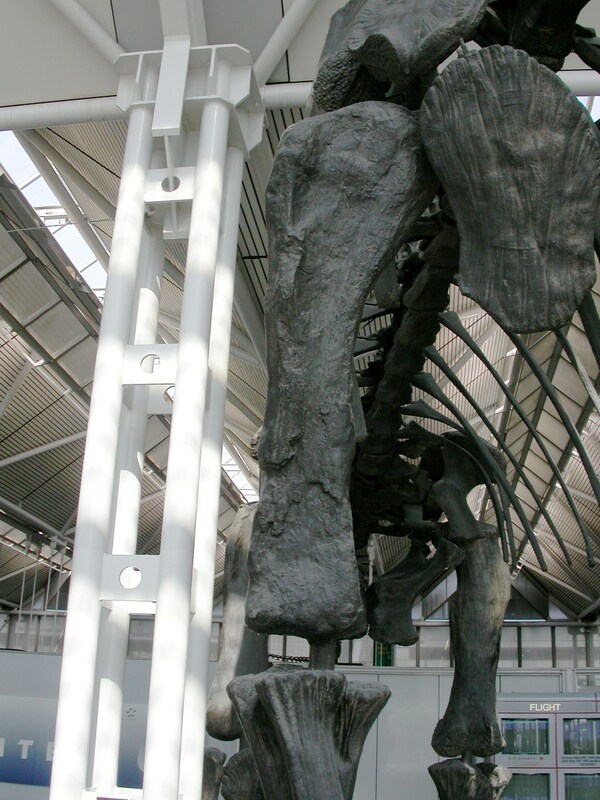 After that, in 1999, we replaced the skeleton in Stanley Field Hall with one on the terrace to make room for Sue the T. rex. On this Brachiosaurus, we have the normal 10 dorsals. 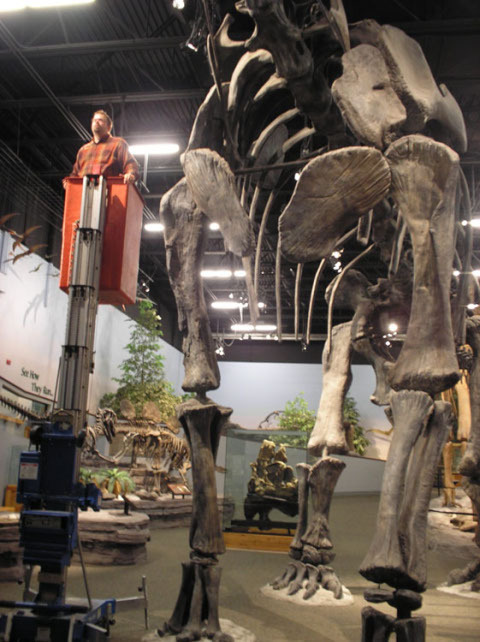 The last Brachiosaurus we mounted is in the North American Museum of Ancient Life (N.A.M.A.L.) at Thanksgiving Point, Lehi, Utah, again a normal skeleton. If this was not enough we restored Seismosaurus halli (now Diplodocus hallorum). This project was sponsored by a Japanese company who was to get the first mount. They took Gillette’s publication and read that the skeleton would have been 150′ long or 50 meters. We soon realized that there was a mistake, that the tail was not missing a huge section but had simply drifted away from the sacrum and the skeleton would not be even close to the predicted length. The Japanese would have none of it. After months of negotiations, we arrived at a compromise and we made the skeleton 40 meters long, 133’+ by adding some whiplash vertebrae until it was that long. By then I had had enough and threw in the towel but not before mounting another Seismosaurus for the museum is Albuquerque which is correct. As for the Berlin brachiosaur: I spent some time in Berlin measuring, photographing and drawing (Donna Sloan did the drawing) the original material there, but they would not allow us to mould it. What I found interesting is that in 1992 when I was there, most of the skeleton of the mount was not original but it was not cast either. It was sculpted wood. I have many more tails (pun, ha,ha) about sauropods. I should write them down sometime. Many thanks to Gilles for allowing us to reproduce this important information. Regarding the number of dorsal vertebrae: it may have been circumstances that forced P.A.S.T to give the mount 12 dorsals, but Migeod’s pre-description of the NHM’s Tendaguru brachiosaur gives good reason to think this is likely the correct count. Similarly, although the torso was therefore longer than Gilles had intended, it might have ended up correct, as careful comparison of the lengths of the Brachiosaurus and Giraffatitan dorsals suggests that the torso of the former was about 23% longer. 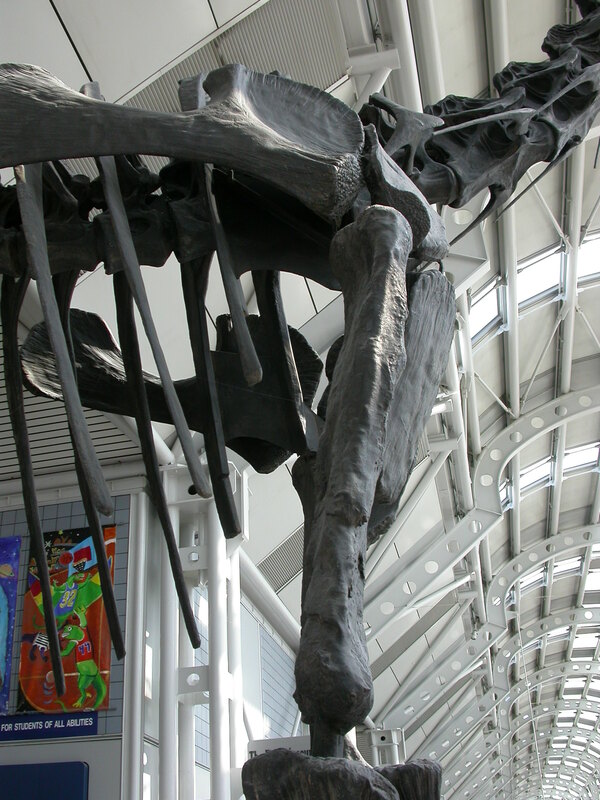 To my shame, I’d not realised that the Brachiosaurus at the airport has two more dorsals than the one in the Field Museum picnic area, despite Matt having posted a ventral-view photo of the airport mount that clearly shows the twelve dorsals and a lateral-view photo of the museum mount that clearly shows ten. When Gilles says “most of the skeleton of the [Berlin] mount was not original but it was not cast either”, I assume he’s referring to the presacral vertebrae, which as Janensch explained in his 1950 paper about that mount were too heavy and fragile to mount. The sculptures in Janensch’s mount were not particularly good, but they have been replaced by much better ones in the remount. Last time we looked at the humeri in the Field Museum’s mounted Brachiosaurus skeleton — especially the right humerus, which is a cast from the holotype, while the left is a sculpture. But Matt’s and my photos of that mount are all pretty much useless scientifically — partly because we were terrible photographers back then, but also partly because the very light background of sky tended to put the skeleton into silhouette and lose a lot of detail. 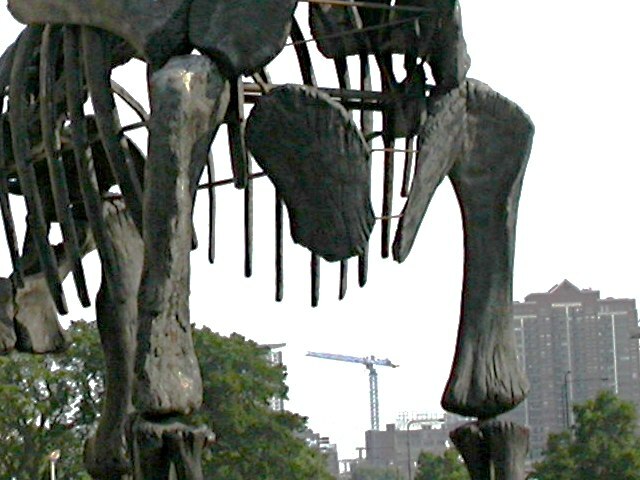 But fortunately there’s another Brachiosaurus in Chicago! 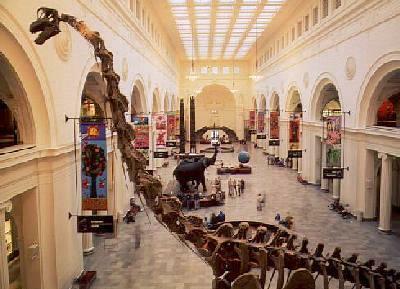 This in fact the original Brachiosaurus mount that was erected in the Field Museum’s main hall in 1993. 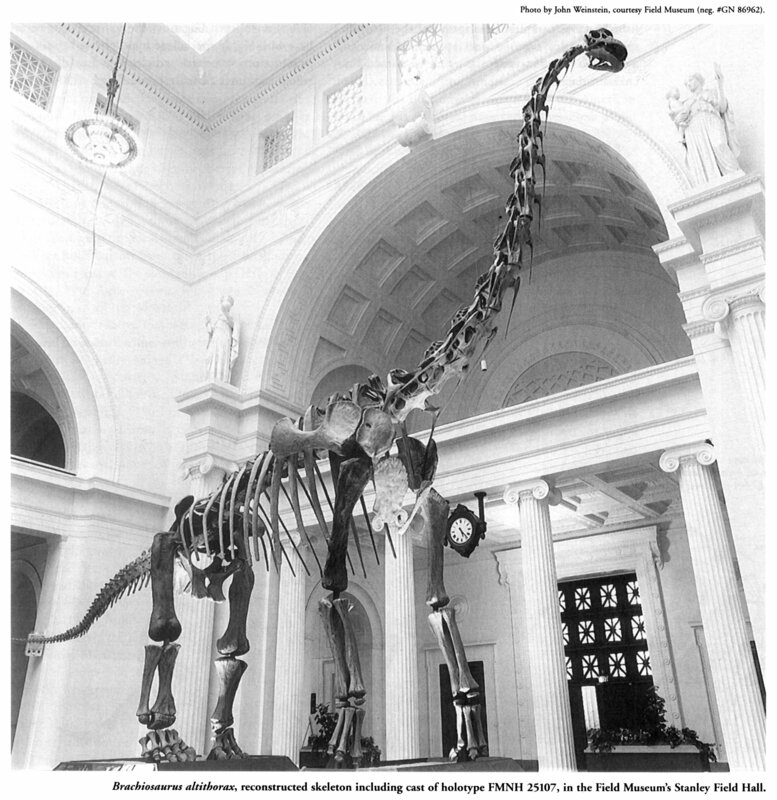 When a certain vulgar, over-studied theropod was installed in that hall in 2000, the surprising decision was made to remove the Brachiosaurus to “make room” for it (even though it’s objectively tiny). The mount was not built to be exposed to the elements, so it couldn’t just be moved outdoors. Instead, a new one was made from more suitable materials for the picnic area, and the original mount was moved to O’Hare Airport. As it happens, I flew into a different terminal at O’Hare. But I knew that this mount was in Terminal 1, so before I get the transit to my hotel, I dragged my luggage across to Terminal 1 and begged the ticket clerk to let me through into the departure area so I could look at it. I don’t now remember exactly what the sequence of events was, but I do recall that phone-calls were made and supervisors were consulted. In the end, someone on staff gave me a platform ticket, and I was able to go and spend a quality hour with this glorious object. It also meant I got to watch nearly every single traveller amble straight past Brachiosaurus giving it literally not even a single glance — see the first photo for an example. Truly depressing. Anyway, I was able to get some slightly better photos of this cast humerus than I subsequently got of the outdoor mount. Though not very many, because — stop me if you’ve heard this — I was young and stupid then. And here is that some bone in lateral view (again, really laterodistal). From this angle, you can really see how shapeless parts of the lateral border of the cast are — which is odd, because there are sharp lips on the actual fossil. In terms of general appreciation of the bone, this next one, in anterolaterodistal view, is probably best — the light caught it in an informative way. Unfortunately, I cut off the distal margin. Sorry. As you can see, the level of detail in the cast is mostly pretty good. For example, you can clearly make out the broken-off base of the deltopectoral crest (the tall light-coloured oval about a quarter of the way down and a third of the way across the bone). That makes the lumpenness of the distal part of the lateral aspect all the more mysterious. Finally, here are both humeri, more or less from the left, so that the real cast is in something approaching medial view. From this angle, you can see that the humerus is noticeably less anteroposteriorly deep than its transverse width. 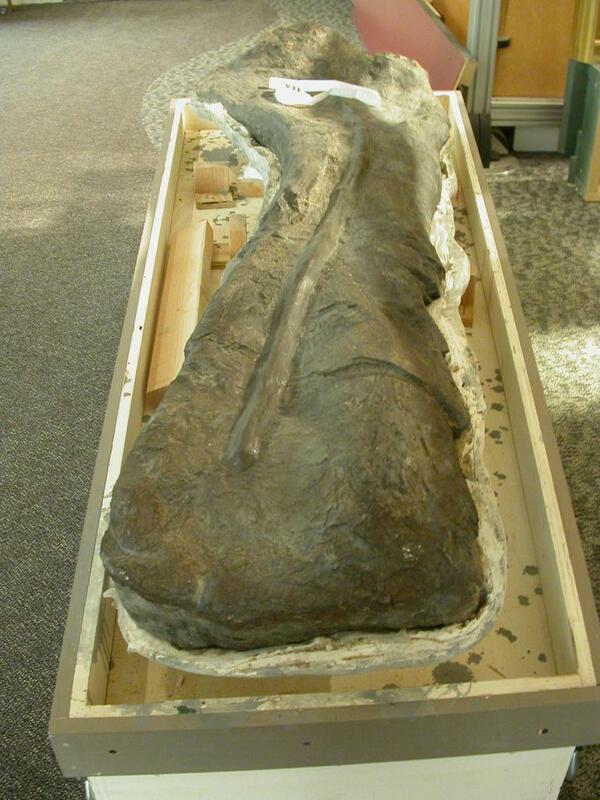 We’ll see this theme cropping up again with brachiosaur limb bones — stay tuned for future posts! 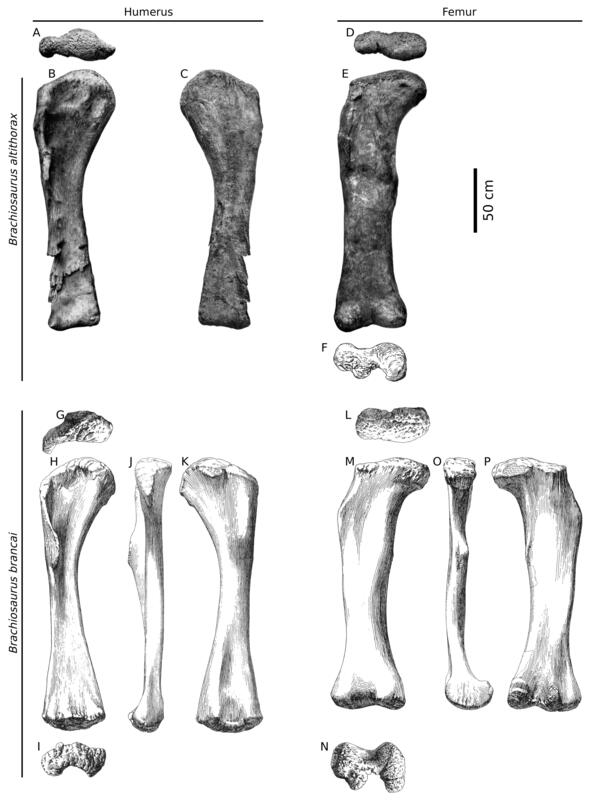 Also of interest: the very nice sculpted humerus on the left side has a complete deltopectoral crest — modelled, I imagine, after those of the various Giraffatitan humeri. 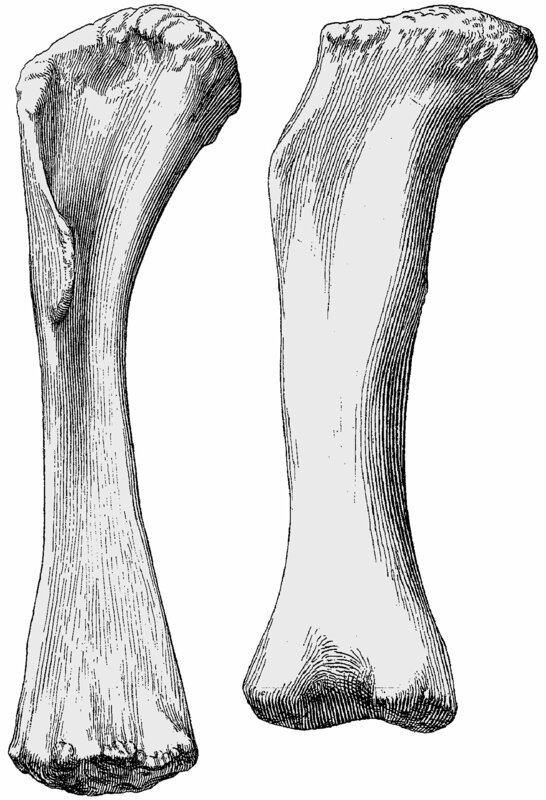 It also has a finished distal end which is much broader than that of the cast humerus. In this, it’s probably right, as the real bone suffered from some decay. And that, I am afraid, is all: stupidly, I neglected to photograph the humerus in posterior aspect, or any of the diagonals other than anterolateral. Next time: exciting news about the relative breadth of humerus and femur in brachiosaurs! As we noted yesterday, the humerus of the Brachiosaurus altithorax holotype FMNH P25107 is inconveniently embedded in a plaster jacket — but it wasn’t always. That’s very strange. I have an idea about that which I’ll come to later. Anyway, although the humerus is now half in a jacket and fully inside a cabinet, we can see it from all angles thanks to the cast that’s part of the mounted skeleton outside the Field Museum. (I can definitively state that this is the greatest picnic area in the universe). As noted in the previous post, Matt and I were idiots back when we visited Chicago, so our photos are mostly useless. We have lots that show the mounted skeleton as art, but very few that are scientifically useful. But what you can make out from the photo above (especially if you click through) is that the textures of the two humeri are very different. Contrast the scarred, pitted surface of the right humerus (on the left of the picture) with the much cleaner and bone-like texture of the left one (on the right of the picture). What’s going on here is that the right humerus of the mounted skeleton is a cast of the original element (bad preservation and all) whereas the left humerus is a sculpture. (Or possibly a cast of one of the Giraffatitan humeri, but I doubt that — it’s a bit too clean and seems more robust than those bones.) 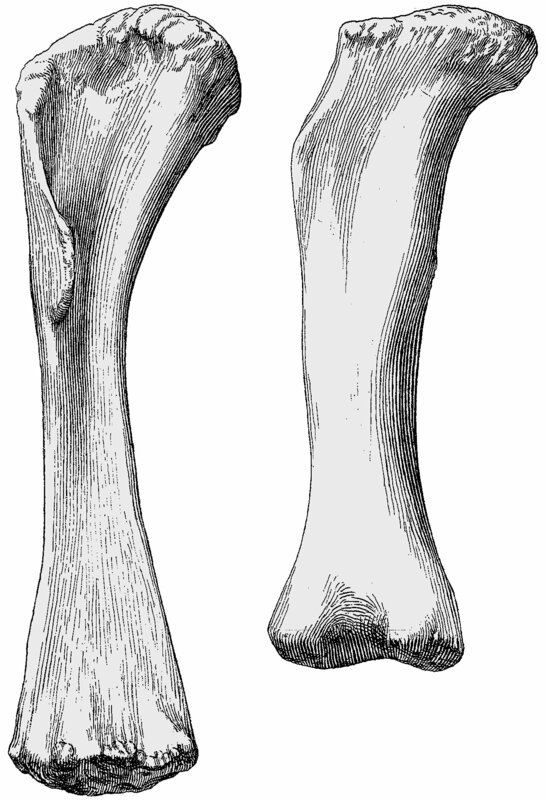 The real humerus is very distinctive, especially in the progressive flaking away on the lateral side of the distal end. Of course you can walk all around the cast humerus and photograph it from every angle — both the posterior that is apparent in the jacket, and the anterior that’s face down and inaccessible. That is a hauntingly familiar feeling. Once you’ve seen that humerus mismatch, you can’t miss it. Finally, then — what about this historical oddity that the humerus was once out of its jacket but is now back in? That doesn’t make a lot of sense to me. I can’t really imagine why you’d do that. So maybe that never happened? 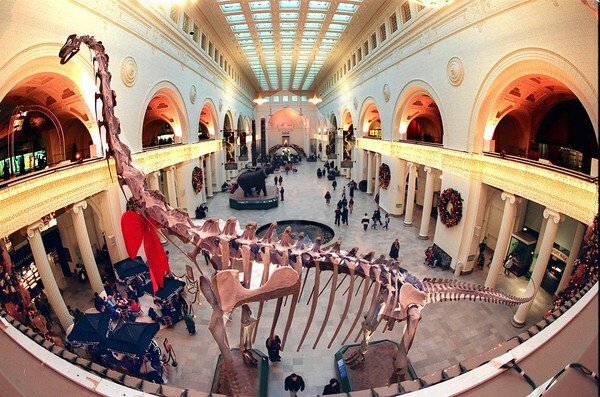 We’ve been taking it for granted that the humerus in the old Field-Museum photo is real, but maybe it’s not. 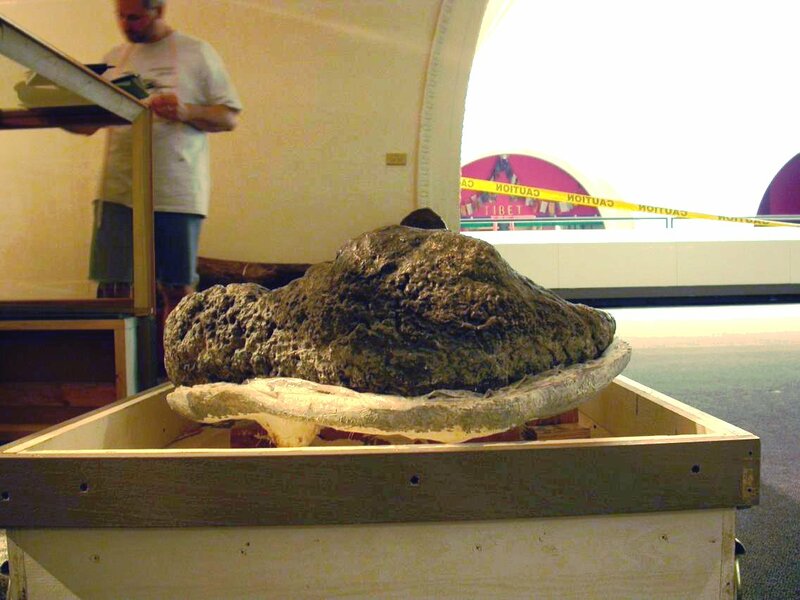 Maybe it was a cast, and that cast is still somewhere in the museum (or indeed incorporated into the mount). Maybe when the fossil humerus was brought back from the field, the jacket was removed from the anterior face and that was cast; then this face was rejacketed, the bone was flipped, the posterior face was exposed (as it still is today) and that was cast. Then the two casts were joined together to make an apparently whole humerus. If that speculation is right, then it should be possible to detect a join running down the lateral and medial faces of the cast humerus that’s in the mount (and apparently in all other mounts). That’s something I’ll look closely for the next time I’m lucky enough to be in Chicago. I wish it was possible to know this kind of thing. I’d love it if every time a museum mounted a skeleton they published an account of how it was done, as Janensch (1950b) did for the original Giraffatitan mount in Berlin, and Remes (2011) did for the recent remount. Unfortunately I’ve never heard of such a paper regarding the Chicago mount, and I don’t even know how long ago it was done (or if anyone who was involved is still alive). The Wikipedia page says the mount went up in 1993, but gives no reference for that and doesn’t say who did it. Does anyone know? Thanks to Ben (no surname given), whose comment below points to a useful 1993 Chicago Tribune article, “Brach To The Future“. This confirms the date of the mount as 1993, unveiled on Saturday 3rd July. The mount is the work of PAST (Prehistoric Animal Structures, Inc.), who bizarrely don’t seem to have a web-site. PAST president Gilles Danis was involved in the process, so he’d be the person to contact about how it was done. Oh, and here’s another relevant Tribune article: “Out Of The Past“. Steven Godfrey is the key player in this account, so he’s someone else to track down. Remes, Kristian, David. M. Unwin, Nicole. Klein, Wolf-Dieter Heinrich, and Oliver Hampe. 2011. Skeletal reconstruction of Brachiosaurus brancai in the Museum für Naturkunde, Berlin: summarizing 70 years of sauropod research. pp. 305-316 in: Nicole Klein, Kristian Remes, Carole T. Gee, and P. Martin Sander (eds. 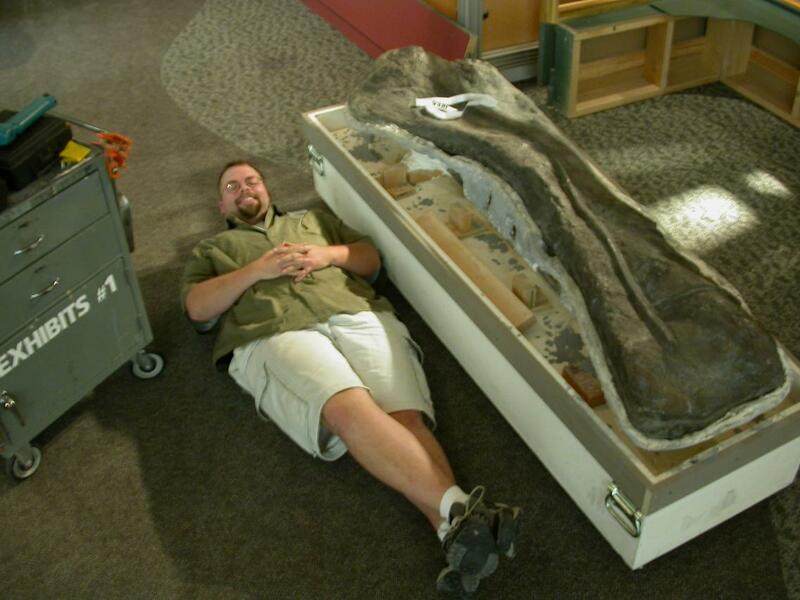 ), Biology of the Sauropod Dinosaurs: Understanding the Life of Giants. Indiana University Press, Bloomington and Indianapolis. Yes, the humerus is half-encased in a jacket, face down (we should post photos some time), which would make the circumference impossible to measure directly. 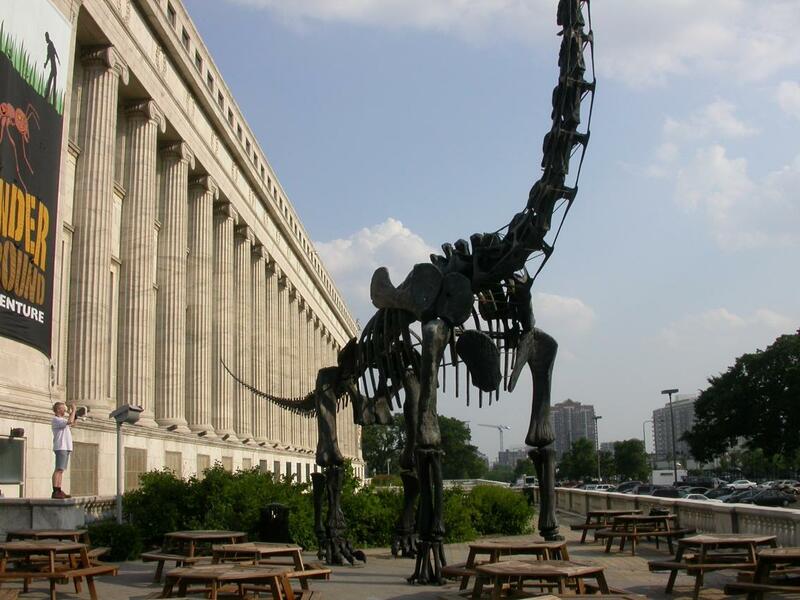 But the mounted Brachiosaurus skeleton right outside the Field Museum (and the identical one at O’Hare Airport) have casts of that humerus, so measuring the circumference shouldn’t require any equipment more exotic than a stepladder. Maybe the anterior aspect was sculpted — but I doubt it, as there certainly was a time when the humerus was out of its jacket and mounted vertically. I have no idea why it was put back in a plaster jacket: does anyone? Next time: what we can learn about the humerus from the mounted skeleton outside the museum! 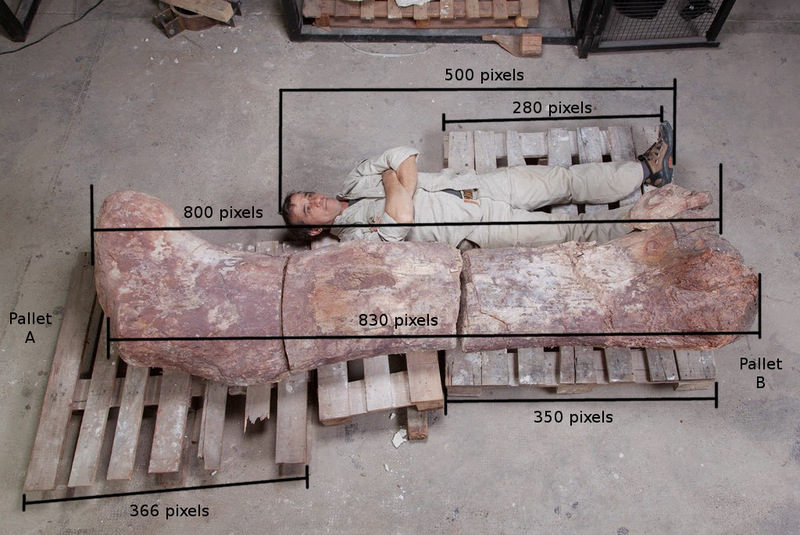 You’ve probably seen a lot of yapping in the news about a new “world’s largest dinosaur”, with the standard photos of people lying down next to unfeasibly large bones. Here’s my favorite–various versions of it have been making the rounds, but I grabbed this one from Nima’s post on his blog, The Paleo King. The first point I need to make here is that photos like these are attention-grabbing but they don’t really tell you much. Partly because they’re hard to interpret, and partly because they almost always look more impressive than they really are. For example, I am 6’2″ tall (1.88 meters). 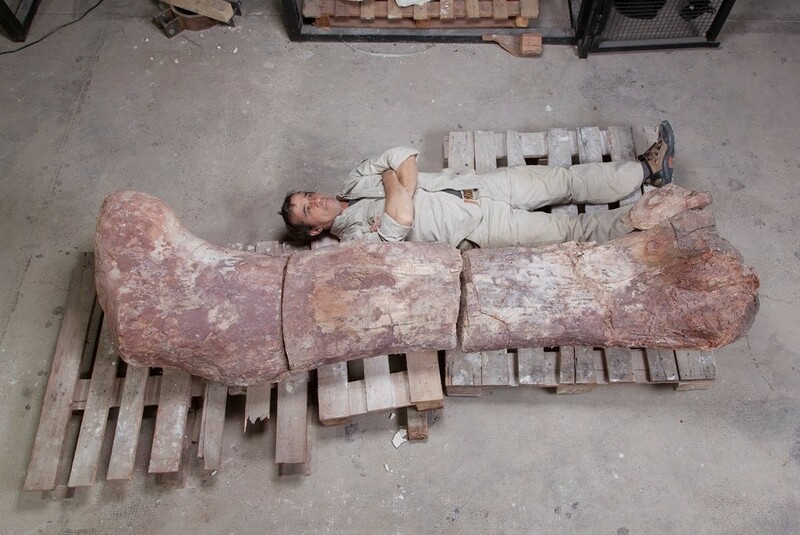 If I lie down next to a bone that is 7’2″ (219 cm) 6’8″ (203 cm) long, it is going to look ungodly huge–a full half a foot longer than I am tall. But that is the length of the femur of the Brachiosaurus holotype–we’ve known of sauropod femora that big for a century now. People get tripped up by this sort of thing all the time–even scientists. Update: even me! Somehow I had gotten it into my head that the Brachiosaurus femur was 219 cm, when it is actually 203 cm. That goof doesn’t affect any of what follows, because from here on down I used Argentinosaurus as the point of reference. Second point: at least some of the reporting on this new find has been unusually–and refreshingly–nuanced. The first news story I read about it was this one, which gives Paul Barrett plenty of airtime to explain why we should be cautious about jumping to any conclusions regarding the size of the new animal. That will turn out to be prophetic. But let’s get back to that photo. Just eyeballing it, it looks like the femur is about half again as long as the dude is tall (the dude, BTW, is Pablo Puerta, for whom Puertasaurus is named). I was reading Nima’s post and he guessed that the femur was in the neighborhood of 3 meters, which would be a significant size increase over the next-biggest sauropod known from fossils that still exist (i.e., not including semi-apocraphyal gigapods like Amphicoelias fragillimus and Bruhathkayosaurus). 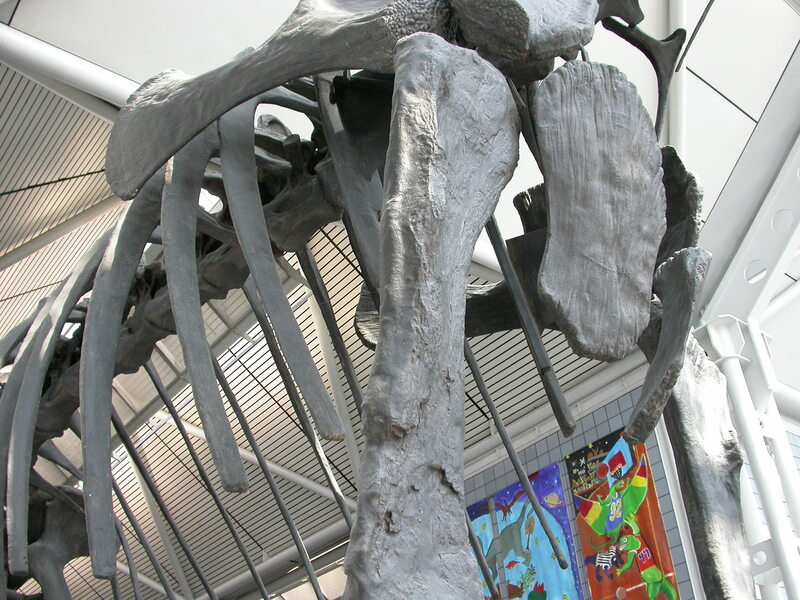 The current based-on-existing-fossils record-holder is Argentinosaurus–there is a partial femur that would have been about 2.5 meters long when complete. So a 3-meter femur would be a wonderful thing. But alas, it just ain’t so–or at least the one in the photo isn’t anywhere near that big. Allow me to demonstrate. Here’s another copy of the photo with some measurements applied. There is no actual scale bar in the picture, but we can use the dimensions of the things we can see to figure some stuff out. For starters, there is a lot of perspective distortion going on here. Pallet B is 350 pixels wide at the near end, 280 pixels at the far end–a difference of 20%. I didn’t put the far-end measurement for Pallet A into the picture, but from corner to corner it is 295 pixels. Shipping pallets vary in size around the world, but in the US the most common size is 48 x 40 inches. Other countries use different sizes, mostly smaller; I am unaware of any standard shipping pallets larger than 48×40. So assuming that the ones in the picture are that size is actually a liberal assumption that will lead to large estimates–if the pallets are smaller than 48×40, then all of the dimensions I’m about to calculate will be smaller as well. Obviously the pallets have their narrow ends facing us, which is nice because 40 inches is almost exactly 1 meter. So we can divide other things in the picture by pallet length and get their dimensions in meters. The near side of the femur is pretty much in line with the stringer running left-to-right down the middle of Pallet A. From the measurements of the ends of that pallet, we’d expect the middle-distance width to be about 330 pixels, and in fact I got 335. The 830-pixel line I drew on the near side is not the total length of the bone–you could add a bit more for the femoral head, to a max of maybe 860 or 870 pixels. Divide that by 335 and you get a max length of about 2.6 meters. The 800-pixel line for the far side of the femur goes from the top of the head to the bottom of the medial condyle, so there’s no extending needed there. That line is at about the mid-point of Pallet B, or about 315 pixels. If Pallet B is a meter wide, the femur is 2.5 meters long. We can also check things by trying to figure out how tall Pablo Puerta is. At first that looks more encouraging for the possibility that this is a record-breaker. If we assume the femur really is 3 meters long, and compare the 800-pixel femur line to the 500-pixel Pablo line, Pablo is 62.5% the length of the femur, or 1.87 meters–about the same height as me. That would be pretty tall for an Argentinian, but it’s certainly plausible. But that’s not a legit comparison, because Pablo is farther from the camera than is the femur. Look at Pallet A–we can use the slats as perspective guides to help figure out where the proximal end of the femur ought to be if projected back to Pablo’s distance from the camera. If we do that at both ends, the length of the femur if placed where Pablo is lying would be 750 pixels or fewer, which would make Pablo at least 2 meters tall. People get a lot taller than that, but it would make him unusually tall, and if you’re trying to emphasize how big your sauropod is, you probably won’t pick the tallest person in the room to pull a Jensen. If we assume Pablo’s about 5’8″–average height for an Argentinian male–then the femur is about 2.6 meters long, which is consistent with the estimates from the pallets. He could well be shorter, in which the case the femur might also be shorter. There are of course vast amounts of uncertainty in all of this. I have heard the number 2.4 meters thrown around in the media, which is within the margin of error of my crude estimates here–I deliberately skewed large at most decision points to give the hypothesized 3-meter femur the best possible chance. I have to emphasize that this is not how you do science–I’m deliberately doing this quick and dirty. But even using these admittedly flawed and somewhat goofy methods, it’s easy to show that the femur isn’t 3 meters long, or anywhere near it. As the post title implies, the new Argentine titanosaur is about the same size as Argentinosaurus. That shouldn’t be too surprising, since the mass estimates that have been quoted in the media are within a few percent of the mass estimates for Argentinosaurus. The new critter might be a hair bigger, but it doesn’t “smash” the record, and when we get actual measurements it could end up being smaller than Argentinosaurus in linear dimensions. I note that the size trumpeted in the media is a mass estimate based on femoral fatness, not femoral length. You’d think that if the biggest femur was demonstrably longer than the 2.5-meter Argentinosaurus femur, they’d lead with that. So the reporting so far is also consistent with an animal about the same size as Argentinosaurus. That is in no way a disappointing result! 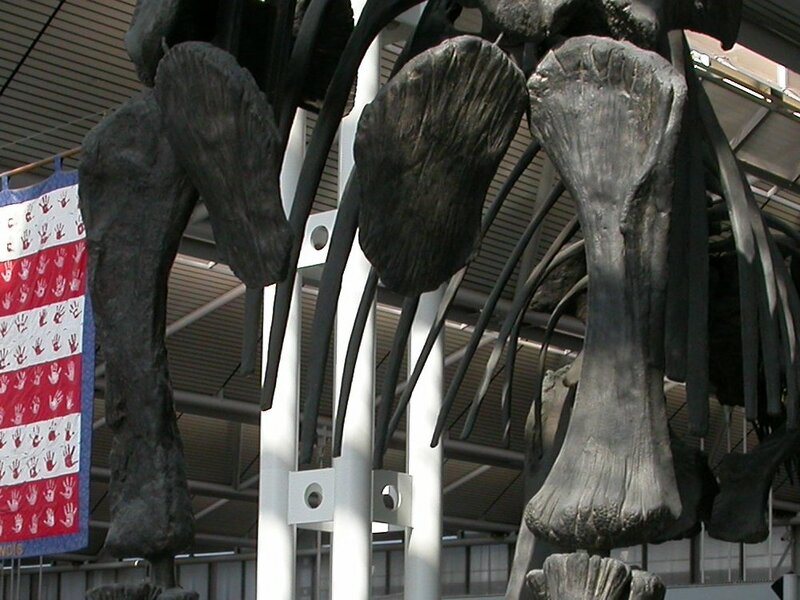 That biggest Argentinosaurus femur is incomplete, so the 2.5-meter length is an estimate. Even if the big femur shown here is only (only!) 2.4 meters long, it’s still the longest complete limb bone from anything, ever. And even if the new animal is identical to Argentinosaurus in size, there’s still a lot more of it, so we’ll get a better idea of what these super-gigantic titanosaurs looked like. That’s a big win. Finally, this is not a case of MYDD. There’s no paper yet, and I don’t blame the team for not making the measurements public until the work is done. I also don’t blame them for publicizing the find. So far, this seems to be exactly what they’re saying it is–an animal about the size of Argentinosaurus, and maybe just a hair bigger. That’s cool. I wish them the best of luck writing it up. I almost wrote “I can’t wait to see the paper” but actually I can–something like this, I’d rather they take their time and do it right. It may not be a record-smasher, but it’s a solid, incremental advance, and science needs those, too.